Earlier this month in Nashville, the rains came down, the floods came up, and a building floated down the interstate. We were lucky and escaped with only a wet basement. However, many more were not so fortunate, including “our” farmers, the Delvins, who lost 70% of their crops, including about 90% of their strawberries. I can’t begin to tell you the lengths we went to in order to save the crops. We stood in pouring rain, lightning, and winds assembling pumps in the strawberries to pump water to drainage areas. We walked in waist high water in our greenhouses at 9 p.m. in total darkness pulling plants from the racks (which thankfully had not been reached by the water) and moving them to trailers and out of harm’s way. Through it all we feel very fortunate. We still have crops that the water did not reach, our homes are not affected and no injuries….Through all the calamities, tragedies and silliness such as birds carrying off the strawberries one at a time, we have cried and laughed with you all, but one thought resonates; you put your trust in us and we will not let you down. And they didn’t. While their fields may have been ruined by the torrential rains, their spirit wasn’t. They cleaned up and replanted. They are farmers. They “just do it” – day in and day out, in droughts, and in floods. They persevered and saved 10% of their strawberries, and I, in turn, made preserves. Although this method takes 3 days, the hands-on cooking time is actually quite short. Yes, there are faster ways, but I prefer this method because it better preserves the bright, fresh taste and texture of the strawberries. By macerating strawberries in sugar overnight and then cooking the syrup, not the berries, for the bulk of the time you get soft-set preserves with big berry chunks and distinct fresh-strawberry flavor. Delicious on toast, biscuits, pancakes, PBJ’s, yogurt, ice cream, or just straight off the spoon! 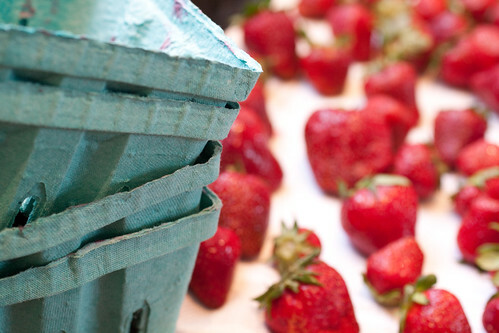 Rinse, dry, and hull the strawberries. Half or quarter large berries and leave small berries whole. Macerate the strawberries with the lemon juice and sugar in a ceramic, glass, or stainless steel bowl in the refrigerator overnight, covered. Stir them gently a few times while they chill so that all the sugar dissolves. The following day, scrape the berries and syrup into a preserving pan, dutch oven, or large (12-inch) saute pan. Bring the mixture to a boil and boil it briskly for 3 minutes, stirring occasionally. Pour the berries and syrup into a bowl and cool uncovered. Cover and refrigerate overnight. On the third day, pour this berry mixture into a colander or sieve set into your pan. Let all the syrup drain into the pan and set the berries aside. Bring the collected syrup to a boil and cook on high heat until you reach 220°F* on a candy thermometer. Skim off any foam (I must confess I usually don’t bother) and stir the preserves gently from time to time for 5 minutes, to prevent the fruit from floating in the jars. Ladle the preserves into hot, clean canning jars, leaving ¼-inch of headspace. (To sterilize the jars and lids, place them in a 225°F oven for 5 minutes.) Wipe off the tops of the jars with a paper towel dipped in boiling water to ensure that no drips get in the way of the seal. Seal the jars by the inversion method – immediately turning the hot jars upside down on a cooling rack for 5 minutes. Then flip them right side up and wait to hear the “ping!” to know they’ve sealed. However, to be on the safe side and guarantee no mold in your jars – although I’ve not had a problem with that and, besides, can’t you just scrape it off? – the USDA recommends processing the jars for 5 minutes in a boiling-water bath instead. (My lawyer older brother made me include that! Though, seriously, I would use this canning method only for jams or preserves. For everything else, use a water bath or pressure canner as directed.) Cool, label, and store the jars in a cool, dark cupboard for up to a year. *This is if you’re at sea level. The jell point temperature is 8°F higher than the boiling point of water. For sea level, it’s 212°F+8°F=220°F. For each 1000 feet above sea level, subtract 2°F from 220°F. For specifics, see here. Note: I like to double this recipe but use 2 separate bowls so the preserves don’t burn. 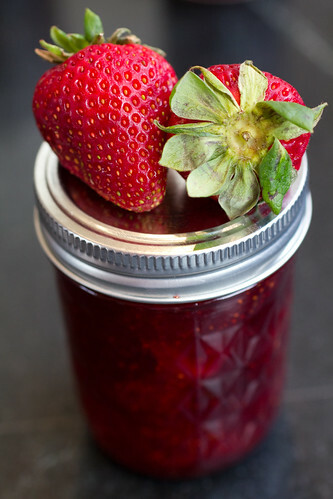 22 Responses to "Strawberry Preserves"
Love your photography! Your jam sounds delicious as well! Thanks, Kathleen. I just took a look at your photos and you’re right – I’m gonna want seconds! Belinda, I definitely agree that local organic berries are worth the wait. That’s another thing I love about Delvin Farms – they’re certified organic. Good food from good people – what a combo! Just wanted to stop by and tell you that now I have the “pump up the jam” song stuck in my head, so thanks. The recipe looks pretty good too. I’m counting the days until the farm near me opens up for picking. How many jars does this recipe make and what size jars do you use? I’m new to canning and can’t wait to try this! Anna, just so “Pump Up the Jam” doesn’t get stuck on auto repeat in your head, you can mix it up with Bob Marley’s “Jammin” or Club Nouveau’s rendition of “Lean on Me” with the “we be jammin” lyrics at the end. Gorgeous photos! I love my Delvin Strawberries, and I was EXTRA thankful for them this year! Good times and bad times in farming (32 acres PYO stwbs.). Your experience is somewhat like having a late freeze, 20 degrees, only slight breeze!! 3-5 mph and praying that your 220 hp Cummins and Chrysler with Gorman-Rupp pumps don’t break down. Sometimes retirement seems a blessing. This year with a small hobby garden, three nights irrigation for frost control and then a flood which required that I wash the mud off the plants. We washed the mud off 11 acres with irrigation one year. Empathy is what I can offer. One of the rewards is when a little child reaches up and says thank you for growing this strawberry. This looks like a delicious recipe. Could you use the canning jars that have the rubber seal and hinged lid? Hi Joe. Sorry to hear that you got flooded, too. 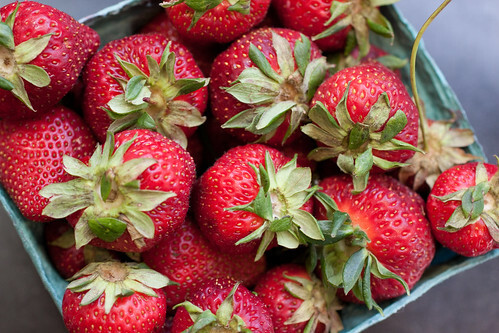 It sounds like you were able to salvage your strawberries – yay! Hi Kathryn – I’m by no means an expert, just an occasional jam maker who hasn’t used that type of canning jar. The USDA claims the jars with the hinged lids and rubber gaskets are unsafe because there’s no way to tell if the jars are sealed without actually opening them. However, this type of jar is used all over the world, especially in Europe, with safe results. So, really, it’s up to you. How soft is the set? I’m new to canning, but I’ve been reading about pectin levels in different fruits, and it seems so many people have trouble setting strawberry preserves without added pectin. I’m just curious what the consistency of yours is like. Hi Chris – These are soft set preserves, as you can see here and here. Strawberries do have a low pectin level but by adding fresh lemon juice (both for acidity and to activate the gelling power of their pectin) and heating the jam to 221, you’ll ensure a good set. If you don’t have a candy thermometer, you can check the set with the plate test. While the jam is cooking, put a small plate in your freezer. When the bubbles are subsiding and the jam seems to be thickening slightly, remove the pot from the burner. Put a few drops of the jam on the frozen plate and return to the freezer. Check the set after a few minutes by nudging it with your finger. If it wrinkles like this, it’s done. If not, heat it a bit more and test again. My husband Tim really prefers this jam with its somewhat thinner consistency and big berry chunks. Try it and let me know what you think. I made the recipe, and the flavor is wonderful. It’s still bright strawberry. I guess I was expecting it to be less set, but cooking sugar that far is going to make something really sticky. It eats wonderfully, but out of the fridge, it’s like super thick molasses. Does this sound like the preserves you end up with (example)? Chris, for your very first batch, I consider that a great success! Welcome to the joys (and frustrations!) of jam-making. Getting the consistency down to your liking just takes practice. There’s definitely a learning curve for making jam without pectin. I’ve never gotten the “sheeting off the spoon” thing, so I use my candy thermometer and the plate test. For a looser consistency, pull the jam off the heat earlier next time and test the set. Remember that it continues to thicken as it cools and overcooking leads to thick and gummy jam. Generally, at sea level, syrup happens at 218 and jelling from 219-221 (softer to firmer set), so it changes quickly from “syrup” to “taffy”. As I’ve said before, my husband prefers it when I err on the side of undercooked as he likes strawberry syrup (pancakes or ice cream, anyone?) but not strawberry “molasses”. Also, I notice you’re in Vail, CO, so your jell point is lower, 205 at 8000 feet. To thin out this batch, try stirring in a little warm water. This particular batch of preserves was not only my first preserves but my first canning. In excitement, I went straight from cooking to canning without really testing the consistency. Silly. As aware of Vail’s boiling temperature as I am, I never considered it affecting sugar stages. I guess I always thought the temperatures had more to do with chemical changes (which I’d think would be hard bound to specific temperatures), but I guess that’s only true once you get to caramelization. Until that point, it’s only water/sugar ratios, and if you’re losing water to boiling, elevation is going to play a role. Thank you for that insight. I’ll try another batch of preserves in a day or two (peach this time, also low pectin), and I will definitely adjust my temperature. I’ll also plate test it more extensively. Thanks Jenn. Thanks you sooo much for sharing this recipe!!! My daughters love to help me make this.. and we have to make it at least 2-3 times a year because everyone loves it!!! I went strawberry picking recently, and I wanted to be sure to make some preserves that are just right. Thanks so much for the blow by blow instructions. Since I’ve never done it before, it’s nice to have a pro give all the details that make it work!